We are first and foremost a SOCIAL company. Our bowling leagues are as SOCIAL as it gets! Yea there are some folks who are competitive no matter the game but the overall feel of the league is play hard, party harder! Bowling teams average 6 players. There is no gender requirement. First and foremost all DC Fray leagues are 50% Social and 50% Sport. We do have officials; however, we expect individuals to respect the league’s culture of fair and fun play. Foul language and rough play will not be tolerated and individuals who cannot adhere to our standards of sportsmanship may be asked to leave the league. DC Fray wants everyone to have a fun and be social while enjoying a great sport. DC Fray will do whatever they can to make sure all players are having fun. Because of these policies, all registrations are on a first come first serve basis and any roster that does not reach our standard size (based on each sport) is eligible to receive free agents and or small group(s) by the league. Rosters made up of primarily free agents and or a collection of small groups may field more players than the standard roster size. This policy is in place to help ensure free agent teams are able to consistently field teams each week and that we deliver on our mission to help people connect socially and to play more often! 1. The commi.sh (Commish) website is your go to for all things about your league. Make sure to log into it regularly to check your team’s record, schedule and to communicate with your team via email. Most teams use the thread to coordinate meetup times, social gatherings outside of games and of course your Spirit Week costumes! 2. Your registration fee includes everything for the season– the bowling, shoes, the drink specials, the league organization, and the Season Parties. 3. Please remember that we are guests of the bowling alley. If something occurs that is against their Code of Conduct, players can be asked to leave the facility and there will be no refunds issued. 1. Each team must have 6-10 players on their roster for the season. Not every player is required to be present each week. There is no gender requirement. 2. Every player must be at least 21 years of age. 3. Per our merging practices from our FAQ page, groups that do not meet the required number of players on a roster may merge with free agents or groups to become a team. 4. Reaching team promotion status does not opt your team from receiving additional players unless you have reached the official roster size (8). 5. Our schedule is a LIVE form. Game times are entered for the season but do have the ability to be moved due to changes with the league, location or teams. Schedule requests can be made but we do not guarantee that we can honor every request. 6. The regular season last 5 weeks. Games and times are generated randomly. 7. Playoffs are determined after the regular season has concluded and are based on scheduling and other league logistics. All teams may not make the playoffs. 1. Teams bowl one match against another team each week for 5 weeks. 2. Each team has approximately 85 minutes to bowl as many games as they can fit in that time. Typically that is 1-3 games. 3. The “Team Score” that counts for your team is the sum of the top 4 scores from ONE game that you choose to submit (the game with the highest 4 scores). You may NOT mix-and-match scores from multiple games. 4. Bowlers who are absent must be skipped on the bowling console. Substitutes may not bowl for missing teammates and a player may not bowl under two names. 5. If a “substitute” was bowling for a missing bowler, or a teammate was bowling under multiple names, the team may be required to forfeit that game or take a zero as one of the counted team scores at the league host’s discretion. 6. If your bowling is shut-off before you finish your current game, existing scores may count as of the final ball rolled. Example if you bowl your first frame as a strike, you cannot assume you will bowl an additional strike and you will be simply awarded 10 for the actual ball bowled. 7. If a bowler comes late, they may join in for that current game, or wait and join in the next one. 8. If a team fields less than 4 players, they may still bowl. However, the missing bowlers will be counted as 0’s. So if three bowlers showed up, the total team score would only consist of 3 scores from their best match. 9. Each player present must participate in at least one game. 10. In the event of a significant lane malfunction that costs 5 minutes or more, the team may request additional time at the discretion of the host. Teams may not have more than 85 minutes of bowling in total. 11. Forfeits (not showing up), are treated the same as a loss with 0 points. 12. Team captains are required to report their scores to the league host THAT NIGHT. Scores not entered by then may be counted as a zero. Your scorecards must be signed off by the opposing captain for verification. If scores are found out to be altered that game will result in a forfeit and we’ll need to have a conversation with the captain and team. 13. Teams may not reset their scores after the first 15 minutes of bowling have elapsed, and they may only reset scores once (unless there has been a scoring malfunction which requires a reset). This is to prevent teams from resetting their scores until they get the best scores possible. Additionally, teams may not skip players such that there are less than 4 players if they have 4 or more players present for the same reason. This will be especially enforced in the playoffs. 14. However – teams may use a “practice period” if they like, provided they reset the scores within the first 15 minutes. If it is during playoffs and the team is playing for the championship, they must let their host know beforehand that they will be using a practice time. 1. A Capital Bowling season is 6 weeks total. The first 5 weeks are the regular season with the 6th week being our Playoffs. 2. The score you decide to use for your weekly match will be the score entered into commish. 3. Standings are based on teams’ Win-Loss-Tie record. 4. In the case where there are ties then we will go with head-to-head matchup, a team’s’ overall average score for the season, and then score differential. 5. For week 6 (Playoffs), teams will be seeded based on standings and their match will be against the team closest their own seed from 1vs2 and on down. How much does it cost to join a Capital Bowling league? Registration dues vary by location and night. Our bowling strives to keep dues low while still providing a quality experience for our members. Most leagues range in cost from $75 – $99. This fee covers insurance, court costs , equipment, player t-shirts, parties, prizes, recruiting, and the tons of other USS events that we will be hosting throughout the year. You definitely get your money’s worth! Each league gets at least 6 organized nights of games, playoffs (if applicable), league shirts, and league-wide parties where you’ll get to meet literally hundreds and hundreds of other players. You’ll also have access to all our other non-bowling related events, shindigs and parties throughout the year. Please note, USS does not issue refunds. ← How much does it cost to join a Capital Bowling league? What’s an DC Fray Bowling night like? ← What’s an DC Fray Bowling night like? A Social Bowling League? What?! That’s right, we took the classic bowling league and SOCIALIZED it to make it great for adults. This isn’t your grandparents’ bowling league! Very casual games, lighthearted fun and LOTS of partying! ← A Social Bowling League? What?! 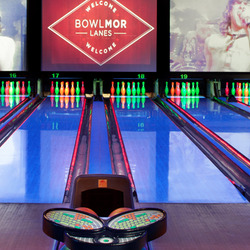 Get Ready Bethesda, DC Fray is excited for another great season of Bowling at the Bowlero in Bethesda this Spring!!! Social Bowling = Awesome. This is a great league to meet new people, have fun bowling AND there's a bar right next to the lanes! This isn't your grandparents bowling league for sure! The season kicks off April 10th and will run for 5 weeks of regular season and one night of playoffs. The game format will be 2 teams versus one another each week. Your team bowls as many games as they can in their 90 minutes of play then the cumulative score of the best 5 games will determine the winner each week! Have you ever been to a Bowlero? They're an awesome place to party at! Like an adult playground! They are also hooking us up with some great food and Bud Light specials for our players! So during and after your games you can relax and enjoy the bar right by your lanes! Teams consist of at least 6 players. If you want to play and do not have a full team, you can still sign up as a free agent and you will be placed into a team with other Free Agents. Every player will get a sweet DC Fray Lanyard in the color their captain chose! Besides an awesome Bowling season you'll have multiple season parties, offers to some sweet events around the city AND giveaways throughout the season! All teams are subject to receive additional players on their rosters unless they have reached "Official Roster Size". For more info check out dcfray.com!